One of the most naturally exquisite and prosperous countries in Sub-Saharan Africa, Gabon attracts adventurous travellers and nature lovers in equal measure. The country straddles the equator on the west coast of Africa and is bordered by Cameroon, Equatorial Guinea, the Democratic Republic of Congo and the Atlantic Ocean. Many travellers opt to 4X4 through this rugged country, armed with little more than a French dictionary, some mosquito repellent and a taste for adventure. 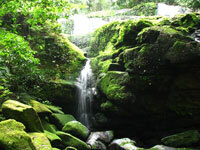 Gabon offers verdant tropical rainforests teeming with exotic wildlife such as chimpanzees, elephants and gorillas. There are vast green savannahs in the Lopé National Park, 500 miles (805km) of deserted sandy beaches, hidden lagoons, and exotic estuaries waiting to be explored. When it comes to African eco-tourism, Gabon is the talk of the town thanks to the government designating 10 percent of the country's land to national parks. Just by being there, visitors are already off the beaten track as everything outside the capital of Libreville is only recently accessible. Travellers in Gabon enjoy the thrill of discovery and exploration in a country which has not yet commercialised its many wonders. Originally inhabited by the Pygmy people, it was colonised by the Portuguese in the 15th century. They named the country 'Gabão', which is Portuguese for 'cabin', after the shape of the estuary of the Komo River. It was later colonised by France in 1885, and went on to gain independence in 1960. The country is stable politically and encourages tourism, but it can still be a dangerous destination as a result of poverty-driven crime. Travellers are advised to be cautious in Libreville and carry a copy of their passport and visa at all times as police are known to hassle tourists. Female travellers should prepare themselves for plenty of unwanted attention, but are equally free to firmly dismiss it. Crime in the capital city is likely to be petty, but is still a concern. For those wanting a more mainstream experience, Port Gentil at the mouth of the Ogooue River offers some wonderful fishing and is popular among European visitors who enjoy the high-life. With so much to see and do, Gabon has enough charm and diversity to appeal to travellers with a hearty sense of adventure and although it is not an 'easy' destination, Gabon richly rewards exploration.